You are in for a serious staycation when you book this package. 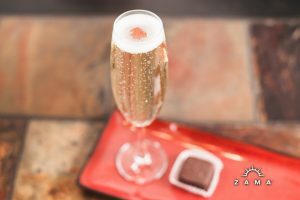 The Salted Caramel Indulgence Package is the new “it” experience here at Zama. Everyone is talking about it and we have thought out every detail to make it absolutely perfect! We have crafted the ultimate package to relax your mind and body, all while melting away the stress that life can bring. Think deep, rich, salted caramel experience that is therapeutic with zero calories! Relax from head to toe with a halo massage. Your experience starts with a 90 Min Salted Chocolate Massage provided in one of our beautiful salt rooms. Choose your preferred modality and while you are enjoying your massage drizzled in warm cocoa butter, breathe deep as vaporized salt gently cleans and removes harmful toxins from your lungs. Our renowned salt generators (halogenerator) silently emit this healing salt therapy. Learn more about Zama’s salt caves here. The aroma that fills the air is salty chocolate decadence! The walls and ceiling of our salt caves are lined with Himalayan salt bricks and panels backlit by hundreds of ambient LED lights. Our most delicious facial comes next! 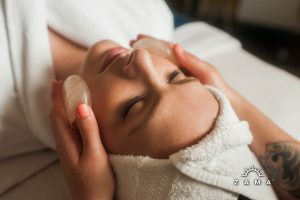 Next, indulge with a customized 60-minute Chocolate Mousse and Salt Stone Facial, which utilizes the healing capabilities of cocoa to nourish and hydrate skin. Cocoa is naturally high in antioxidants and this chocolate mousse masque is also rich in Vitamins-E, C, and B3, which boost collagen and rejuvenate skin. 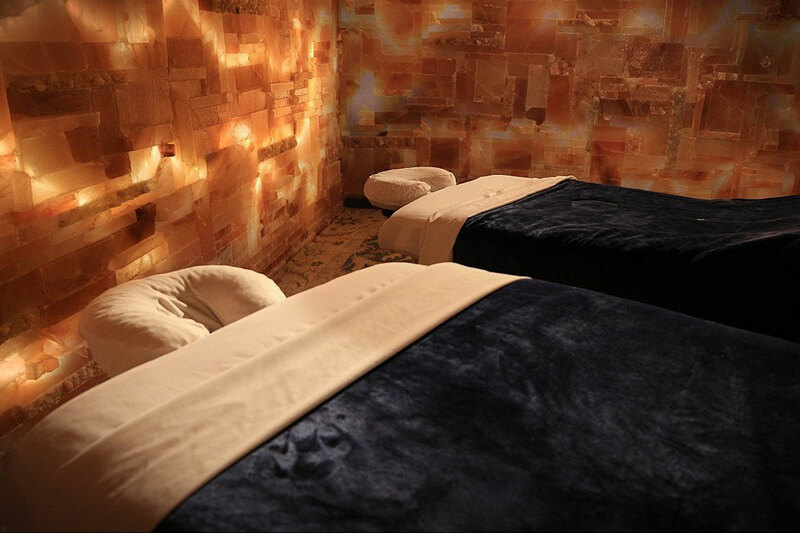 Salt stones are used during the massage portion and offer a deeper layer of healing and skin repair. Finish with a warming and healing pedicure. Finally, sit-back and relax during a stress busting Hot Stone and Warm Cocoa Butter Pedicure. A longer and more luxurious service than a standard pedicure, it includes all the extras: aromatic and detoxifying scrub for the feet and legs, a hot towel wrap for the feet, callous removal, and a hydrating massage cream to restore and renew. We soak and soften your feet in warm, aromatic essential oils while we carefully analyze your nails. After expert nail and cuticle care your legs and feet are then exfoliated with our essential oil scrub. Heated cocoa butter drizzled on your lower legs and feet will deeply nourish and hydrate your skin while a hot stone massage on your calves and feet amplify the experience. Finish with a gentle buff to shine or polish from our five free Deborah Lippmann nail line! The finishing touch is our delicious Champagne and Salted Caramel Truffles from Missionary Chocolates. 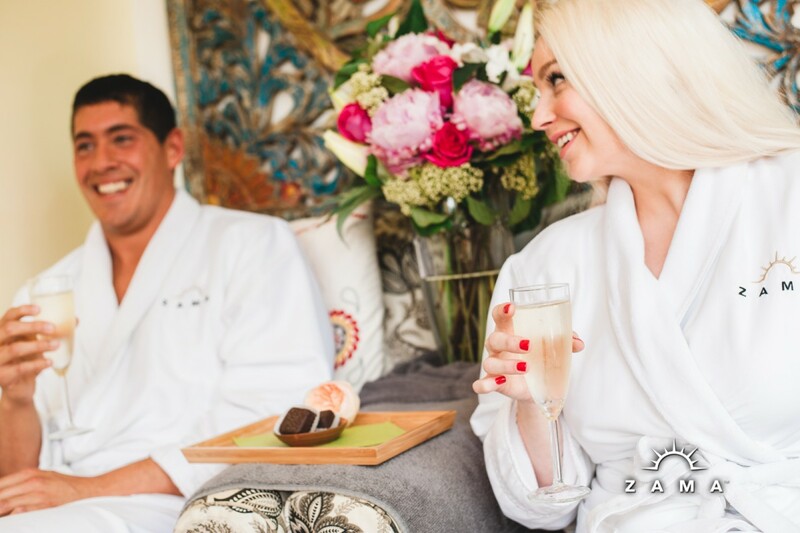 This package can be booked by calling our Spa Concierge at 503-281-0278 or book online here!